For someone who grew up in the marshy splendor of the Lowcountry, I sure am developing a traitorous love for New England summers. Rob and I visited coastal Maine two summers ago and have been waiting for an excuse to head back up north for a weekend in the summertime. Where else can you get the casual, beachy and briny vibes paired with temperate summer days and a delicious, occasional dose of sweater weather in July? Fortunately for us, a dear friend of mine decided to get married on the North Fork of Long Island, her summer stomping grounds where her grandparents (and great-grandparents before them) have a beautiful home on the Peconic Bay. From a writer's standpoint, I apologize that this post is not as thorough as I had hoped it would be. As a bridesmaid in my friend's wedding, much of the weekend was spent with my college pals, catching up, laughing, and falling in love with our friendships all over again as adults. Perhaps in part because of this reunion, as the weekend ran its course I developed a profound connection to this small, agrarian place, and I cannot wait to return. We stayed in the charming town of Greenport, NY, where a single street takes you among rustic cedar shake homes, kitschy souvenir and antique shops, and bars that run the gamut from lowly dives to the height of hipster condescension. On the corner of Front Street and Main Road you'll find Crazy Beans, a small, family-friendly diner that dishes up a bacon, egg, and cheese sandwich on homemade bread that will have you salivating. The home fries are a must, especially after a wild night out: we had three, and met each morning at Crazy Beans to debrief. Their slogan, "Breakfast. Lunch. Coffee. Craziness." pretty much sums it up. I should also mention that they have the most extensive collection of wacky salt and peppers shakers. Right on the bay and in the center of Greenport is a lovely antique carousel built in 1920. It's $2 for a ride with a side of nostalgia- they even have an old-fashioned ring game in which you try to snag the brass ring for a free ride. Our favorite place in Greenport is one of those that I actually hate to write about because it is so beyond perfect I never want anyone else to go. Ugh, fine. If you're a fan of raw oysters, those sensational slimy silt sifters, you have to visit Little Creek Oyster Co. Located right on the docks on Greenport, they serve the freshest local oyster catch in the coziest little shack. 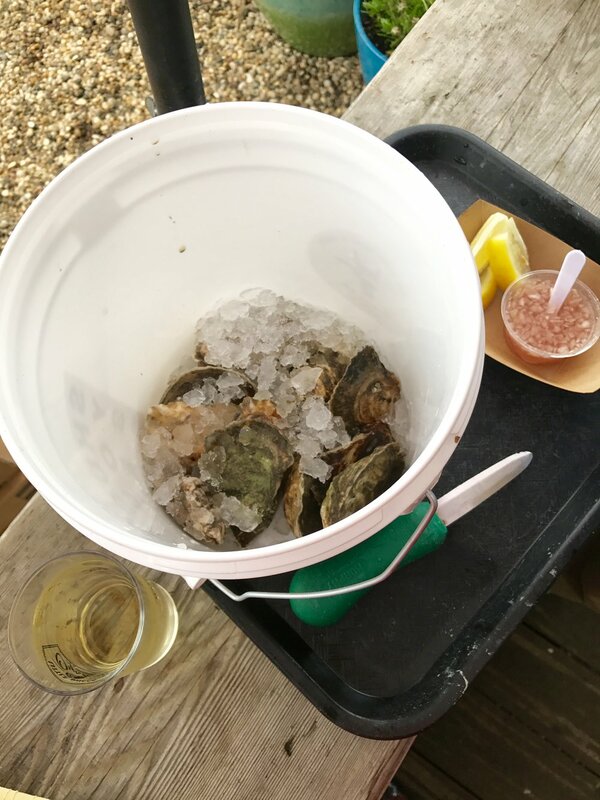 Be adventurous, save some money and order the "Shuck Your Own" bucket. They'll give you the gloves, the knives, and will show you how to pry open the shell to get to the goodness inside. Pair your oysters with Greenport Harbor Brewing Co.'s Summer Ale or a glass of crisp muscadet. If you've seen my wine tasting write up from Hvar Island, Croatia, you know I'm a lush for vino. When the bride-to-be suggested a tasting during our visit, I was intrigued because I never knew New York to be a producer of wine. As it turns out, viticulture was established on Long Island in the early 1970s and has flourished ever since. It makes sense that growing and harvesting grapes would be a natural success in this part of our country with loamy, well-drained soil and nurturing warm summers tempered with cool maritime breezes. This unique terroir produces delicate wines with a very distinct personality. We only had time to visit two wineries and I would recommend both. The first, Sparkling Pointe, as its name suggests, had an excellent selection of brut and sweeter sparkling wines. Off of County Road 48 in Southold, NY you'll find Sparkling Pointe winery nestled among neat rows of leafy grapevines. As I'm not the biggest fan of sweeter wines, I abstained from the full tasting, however, their 2014 Brut was a delightfully well-rounded drink, a great harmony of citrus, minerals, and the quintessential "toastiness" of a good sparkling. The vineyards at Sparkling Pointe make a beautiful backdrop for a tasting! Next we headed to Kontokosta Winery closer to Greenport. If you're looking for a jaw-dropping setting, look no further. In addition to beautiful plots of grapevines, this winery boasts an expansive lawn dropping into the sound beyond. The winery itself is a striking, minimalist, barn-like structure with a bright interior and floor to ceiling windows that frame the stunning scenery. The wines here were excellent as well. In the summer heat I opted for a cool viognier, a white varietal, which was quite good. Had it been cooler I may have tried their award-winning cabernet franc, which is supposed to be top-notch. Already I cannot wait to plan another visit to the North Fork to check out more of the scenery. For details on more wineries and the viticulture areas of Long Island, check out this site on Long Island Wine Country. I'll definitely be using it to plan my next trip up there. I also plan to spend more time exploring the natural scenery and beaches, as well as taking advantage of the farmers markets- all of the produce up there exudes freshness and color! Air travel: You can fly into any of the NYC airports (we flew into LaGuardia because it was cheaper), however, Islip airport is closer to attractions on the North Fork. Ground transportation: Since we were there for a wedding we had to plan so far in advance so it was simplest to just rent a car. The summer schedules for the Long Island Railroad and the Hampton Jitney had not been posted yet. Honestly, I'd rent a car again. That way you have the means to explores all the nooks and crannies of the North Fork. There's no Uber or Lyft up there and taxis are quite pricey, so you may want the autonomy of having your own whip. Accommodations: We rented an Airbnb because we were on a budget, and it was great! We loved having the flexibility that a home rental offered. If you're going to Greenport and hotels are more your thing, check out Greenporter Hotel and the Harborfront Inn, and look into Shelter Island and other nearby places as well!